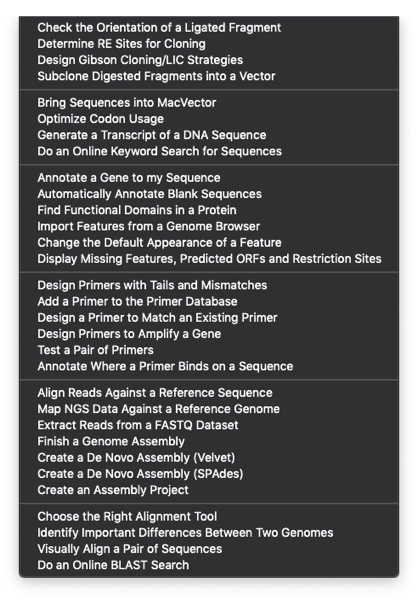 MacVector talk | General musings from the MacVector team about sequence analysis, molecular biology, the Mac in general and of course your favorite sequence analysis app for the Mac! 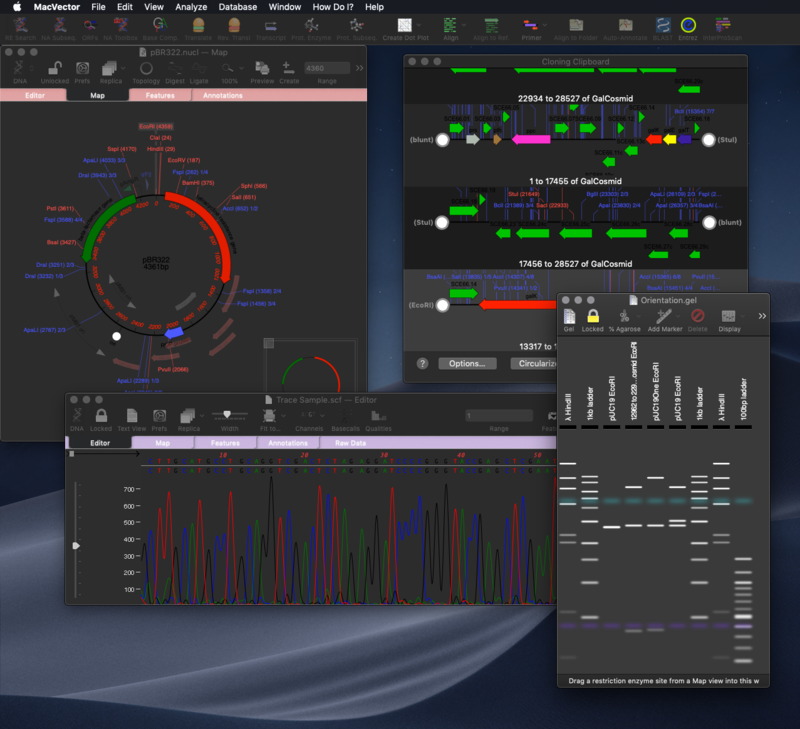 General musings from the MacVector team about sequence analysis, molecular biology, the Mac in general and of course your favorite sequence analysis app for the Mac! What can MacVector do for my lab? Here’s what MacVector can do for your lab. Whatever type of alignment your sequence needs, there’s a tool in MacVector. CRISPR Indel Analysis: Identify insertions and deletions following CRISPR editing of a target. Compare Genomes: Compares two related annotated genomes to identify identical, similar and weakly similar features. Sequence assembly of NGS data against a reference genome or compare your sequencing against your new construct. Coverage Tab: Compare different datasets assembled against the same reference sequence with expression level comparison. Translated Multiple Sequence Alignments: Align DNA sequences based on their translations. Align proteins against a reference great for comparing known proteins against an unknown one. 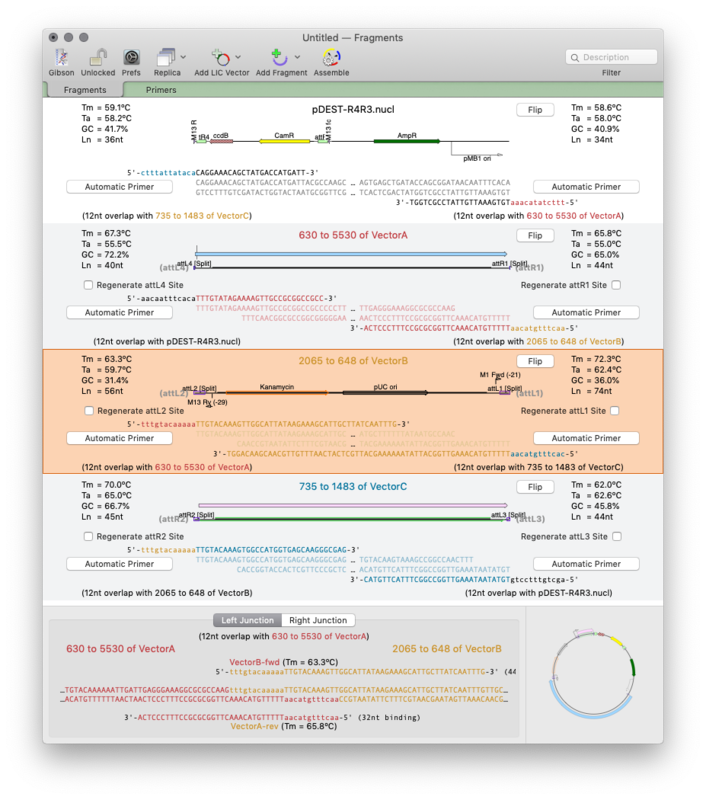 Auto Annotation of common plasmid features to blank sequences. InterProScan: Scan proteins for functional domains against many databases. How Do I? : new menu shows common workflows with step by step guides. Every tool has a link to a video tutorial. As simple as dragging a fragment to a cloning vector. Flexible Cloning Subclone with restriction enzymes, Gibson cloning, Gateway and more. Cloning history Every step is documented. Agarose Gel to run out digested sequences. Easily identify site(s) to differentiate successful clones. Restriction Enzyme Picker: easy identification of useful enzyme cut sites. Gibson/Ligase-Independent Assemblies: Automatic primer design and assembly for Gibson Assembly or Ligase Independent Cloning workflows. QuickTest Primer changes primer design. Hairpin? Nudge your primer until it goes. Add tails to your primers with silent restriction sites/mismatches and view reading frame changes. Quickly design pairs of primers click a region to get the best primer pairs to amplify it. Nobody has time to read manuals nowadays and so with that in mind we set out to try to help new users get up to speed quicker and help more advanced users know tools they may not be that familiar with. 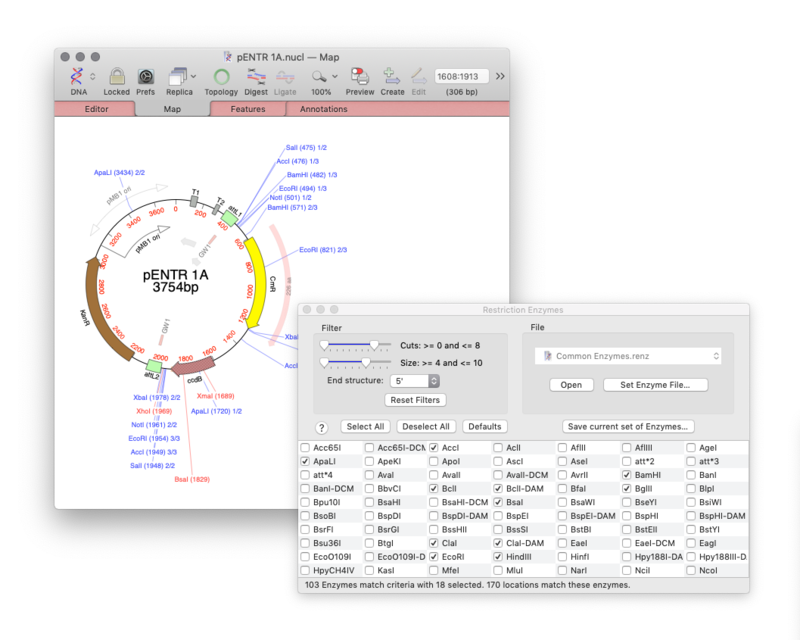 MacVector 17 introduces a new menu which lists common workflows that a molecular biologist may need. Each topic has a short video and/or a short step by step guides. What’s more is every tool’s dialog now has a link to a video tutorial. So if you need to know how to do something then try the HOW DO I menu. If you need to know more about a tool then click the (?) button in every dialog. MacVector 17’s brand new Restriction Enzyme Picker gives you an interactive way to quickly show what enzymes will digest your sequence. You can dynamically filter what sites are displayed. For example to show just 3’ overhang cutters or use other criteria. What’s more is that you can take a set of cut sites from one sequence (for example an expression vector) as the input to digests of other sequences for easier optimizing of construct workflows. However, along with the Cloning Clipboard and the Graphics Palette you might find your screen has the dreaded window clutter. So we’ve added two new toolbar buttons to very quickly show or hide the floating tools. 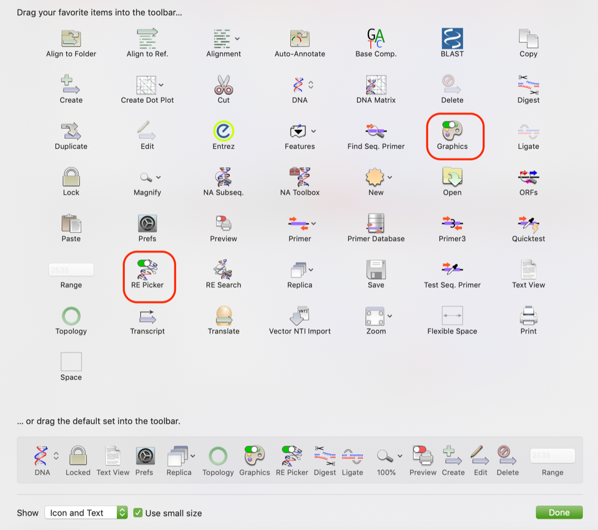 A few users with customized window preferences may not see these by default. If this includes you, right-click (or [ctrl]-click) on the toolbar and choose Customize Toolbar in the popup menu. Drag the two buttons to your toolbar, or drag the default set of toolbar buttons. MacVector 17: Our most feature packed release yet..
MacVector 17 will be released later this week. Get ready for our biggest release yet. MacVector 17 compares genomes, makes restriction enzyme cloning easier, automates the design of Gibson Assembly and Ligase Independent Cloning strategies. Makes plasmid maps even more beautiful and supports macOS Mojave’s Dark Mode to aid concentration on those late night primer design sessions! For sequence assembly there’s a stack of new features. Align to Folder has a new Assembly Problems tab that identifies possible issues with your assembly (and what to do about them). 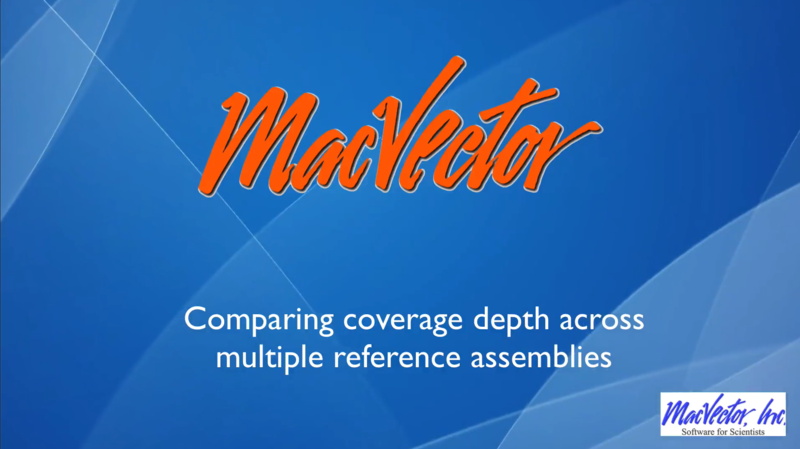 For reference assemblies in Assembler there’s a new Coverage tab that allows you to compare multiple assemblies when mapped against the same reference. For example you can compare different sequencing datasets from different samples, the same dataset mapped with different parameters, or compare RNAseq datasets. For cloning the new Restriction Enzyme Picker gives you an interactive way to quickly show what enzymes will digest your sequence. The new floating tool initially presents you with a list of all available sites in a sequence. However, you can filter on many attributes, such as number of cuts, 5’ or 3’ overhangs and blunt ends. What’s more is that you can take a set of cut sites from one sequence (for example an expression vector) as the input to digests of other sequences for easier optimizing of construct workflows. For non restriction enzyme based cloning the new Gibson Assembly/Ligase Independent Cloning tool provides automated design of ligase-independent cloning strategies. The tool supports 5’ exonuclease driven Gibson assembly as well as the T4 DNA Polymerase 3’ exonuclease “Ligase Independent Cloning” approach. It can automatically design primers when you specify fragments and vectors to use. Alternatively you can provide custom primers (manually or from tools such as the NEBuilder website). You can also just provide existing fragments with overlapping ends for MacVector to assemble. 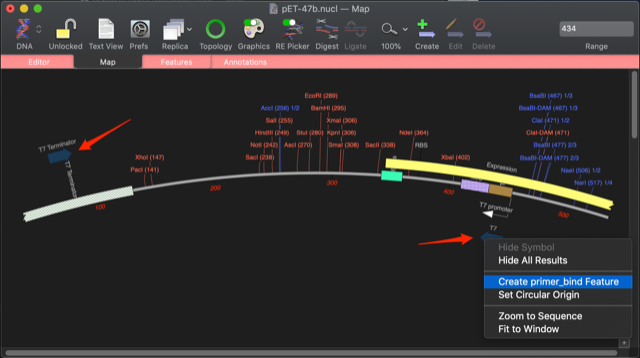 The interface shows the exact structure of the junctions between fragments, including relevant CDS translations for confirming the frame of protein fusions. The cloning strategy can be saved as a new cloning project document and finally automatically assembled into a single sequence. Over the past few releases many new tools and features have been added to make fully annotated and beautiful plasmid map’s easier than ever. Continuing this theme MacVector 17 now utilises the power of the Primer Database and will automatically display your very own freezer drawer collection of oligos directly on your sequence, automatically! That means when you open even blank unannotated sequences you will see common features, RE recognition sites, putative ORFs and now your primer binding sites. Scan for.. 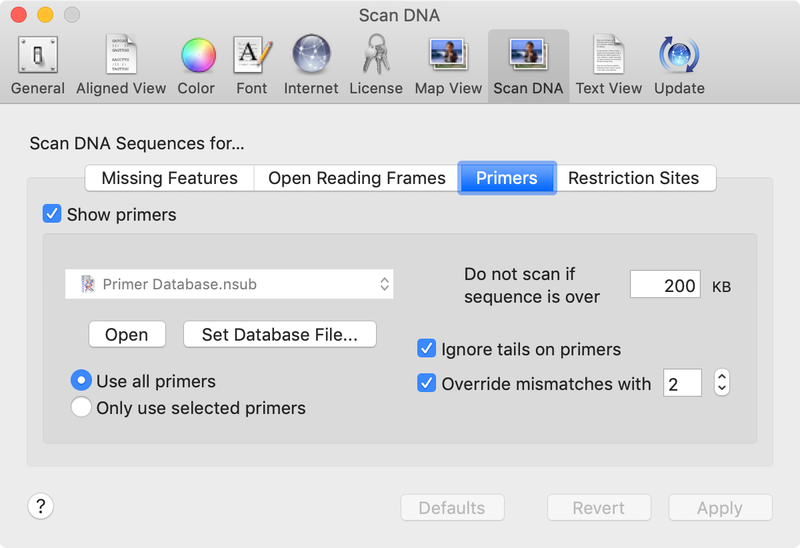 Missing Primers joins the existing Scan for tools that automatically display restriction sites, missing common features and putative open reading frames on your sequences. This release is also aimed at making life easier for new users. There’s a brand new How Do I menu that shows common workflows with either simple step by step guides, or short videos. Plus every tool now has a link to a help topic on how to use it. MacVector has always been easy to use, but now even the most complicated tool has a simple way to get started… Quickly! Finally we’re excited to announce that MacVector 17 supports macOS Mojave’s Dark Mode. When you are working late at night designing those constructs, then Dark Mode will help aid your concentration! There’s also a more detailed list and the Release Notes. Dark Mode Support: use macOS Mojave’s Dark Mode to aid concentration on those late night primer design sessions! Restriction Enzyme Picker: a new tool for easy identification of useful enzyme cut sites. Dynamically filter Restriction Enzymes to simplify the identification of useful enzyme cut sites. Use cut sites from one sequence as the input to others for planning construct workflows. Compare Genomes: Compares two related annotated genomes to identify and list identical, similar and weakly similar features along with missing features. Gibson/Ligase-Independent Assemblies: Automatic primer design and assembly for Gibson Cloning or Ligase Independent Cloning methods. Assembly Problems: identify mis-assembled sequences based on excessive mismatches, discontinuous reads and other common problems. 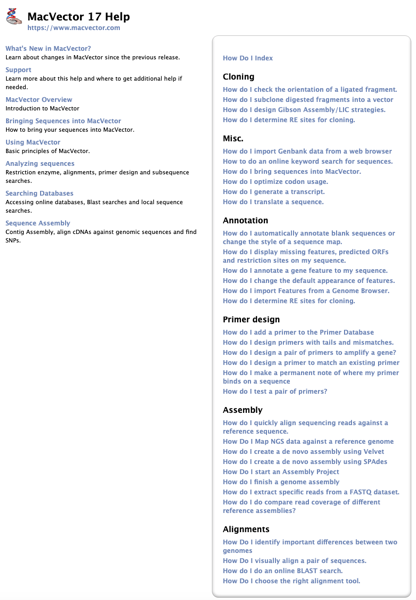 Redesigned Assembly Project: Easier organization of multiple datasets, multiple reference sequences and repeated jobs. If you have active maintenance and are running MacVector 15.5.4 or later then you will be notified about the new release. To install this version, you must have a maintenance contract that was active on 1st November, 2018. You must also be running MacVector 15.5.4 and OS X 10.9 Mavericks or later. If you have an older version of MacVector then download the trial and request an upgrade quote. Even if you have downloaded the trial in the past then downloading a new trial will give you a fresh 21 days to evaluate MacVector. When a trial license expires it becomes MacVector Free. So if you decide against upgrading then you can just delete the trial license and easily go back to your current version. It’s risk free as MacVector files are backwards compatible. One new feature in our upcoming MacVector 17 release is the ability to automatically display primer binding sites in each DNA sequence that you open. Here’s an example of a couple of primers displayed on the popular pET 47b LIC cloning vector on each side of the LIC cloning site. The image shows how MacVector 17 has also been optimized for macOS Mojave “Dark Mode” and also includes a right-click popup menu that lets you quickly annotate interesting binding sites with a simple mouse click. 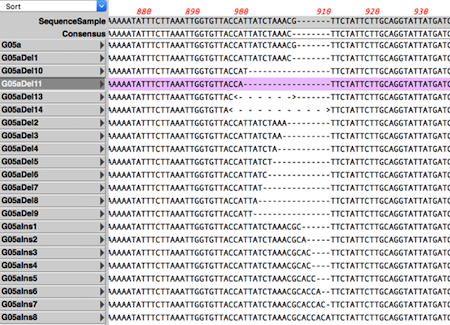 The feature is controlled from the MacVector | Preferences | Scan DNA | Primers tab. My default, it uses the Primer Database.nsub file that you can find in the /Applications/MacVector/Subsequences/ folder, but you can point it to any .nsub file of your choosing. Restoring file associations when MacVector no longer opens your sequence documents. Macs are pretty good at choosing the right application to open a document. For example when you double click on a .nucl document then it will open in MacVector. However, sometimes this file association breaks. Applications should coexist peacefully on a Mac, but sometimes a misbehaving app will corrupt these file associations and you will find that your sequence displays a generic document icon (or what’s worse a different application!). 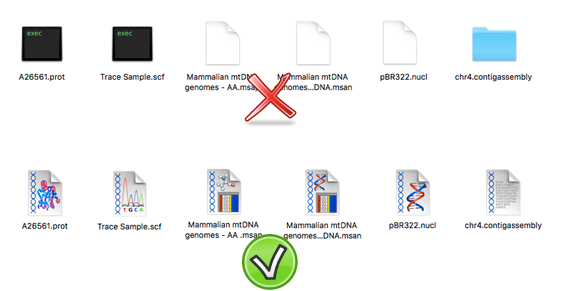 When you double click on the icon, it will no longer open in your favourite DNA sequence analysis tool! Choose File | Get Info (or use command-I). Then click on the Change All… button to apply the change to all files. If you are interested in making changes to a protein sequence, it is often useful to make a change to the coding DNA that will create a restriction enzyme site. Conversely, there may be times that you would like to create a site without affecting a protein coding region. You can accomplish this using the Analyze | Quicktest Primer (Individual) function. 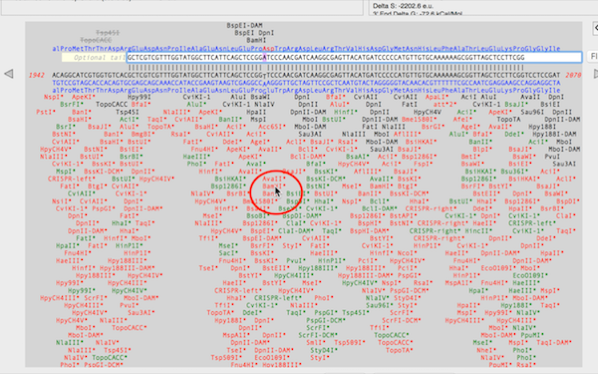 Make sure that any protein coding regions in your target DNA are annotated as CDS features – this is critical as MacVector will key off such features when displaying translations. The resulting dialog shows the selected sequence aligned to the parent molecule, complete with restriction sites and the translations of the protein coding features (here shown in blue as they are on the minus strand). Restriction sites in black are those currently present in the sequence. Those in red and green are “one-out” sites (e.g. a 3 out of 4 or 5 out of 6 match), where changing a single residue would create a new site. Those in red would change the amino acid sequence of the encoded protein. Those in green would be silent changes, not affecting the protein sequence. If you click and hold on a restriction enzyme site, the sequence is temporarily changed to match the restriction site and any changes are reflected above the line. In the example above, clicking and holding on a red BamHI* site would change a Glu residue to an Asp in the protein coding sequence, and would create BspEI and DpnI sites in addition to a BamHI site in the molecule. If you double-click on a site, the change is entered permanently. You can also nudge the sequence to the left and right using the arrow keys. If your display does not look similar to the example, click on the Settings button and make sure you have “Include one-out sites” and “Use all enzymes” selected. Have a great Christmas and here’s to an awesome 2019..
MacVector 17 has a greatly improved Assembly Projects manager, for better organization of multiple sequencing datasets, multiple references sequences and repeated jobs. Every time you run a new assembly job (either a reference assembly or de novo). A new job object is created in the Assembly Project window contains resulting contigs and any unaligned reads from the assembly. A new properties tab lists all of the relevant details for the currently selected job, including input parameters, total assembled reads, average contig length, total contig length and N50 to give you an idea of the quality of genome assemblies. A new Coverage tab directly compare multiple reference assemblies. You can compare different sequencing datasets assembled against the same reference sequence with expression level comparison. Now that you can store multiple assembly jobs in a single Assembly Project, you can also directly compare multiple runs of the same dataset against a single reference sequence to compare which is the best assembly. MacVector 17 was released February 2019. It contains brand new tools for comparing genomes, making restriction enzyme cloning easier, automated design of Gibson/LIC cloning strategies, highlighting assembly issues, comparing multiple sequence datasets against a single reference and making plasmid maps even more beautiful, by displaying your own primer binding sites! Finally MacVector 17 supports macOS Mojave’s Dark Mode to aid concentration on those late night primer design sessions! MacVector 17 has a completely new tool for automated design of ligase-independent cloning strategies. The tool supports 5’ exonuclease driven Gibson assembly as well as the T4 DNA Polymerase 3’ exonuclease “Ligase Independent Cloning” approach. 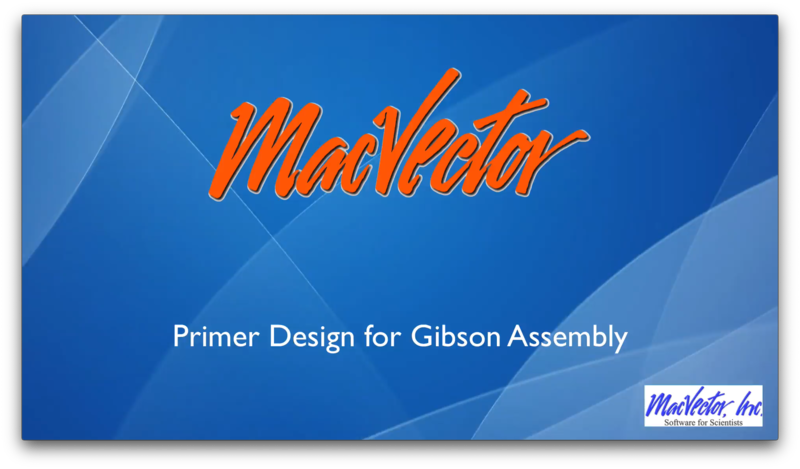 MacVector can automatically design primers when you specify fragments and vectors to use. You can provide custom primers (manually or from tools such as the NEBuilder website). You can also just provide existing fragments with overlapping ends for MacVector to assemble. The interface shows the exact structure of the junctions between fragments, including relevant CDS translations for confirming the frame of protein fusions. The cloning strategy can be saved as a new cloning project document and finally automatically assembled into a single sequence for export. MacVector 17 was released in February 2019. It contains brand new tools for comparing genomes, making restriction enzyme cloning easier, automated design of Gibson/LIC cloning strategies, highlighting assembly issues, comparing multiple sequence datasets against a single reference and making plasmid maps even more beautiful, by displaying your own primer binding sites! Finally MacVector 17 supports macOS Mojave’s Dark Mode to aid concentration on those late night primer design sessions!